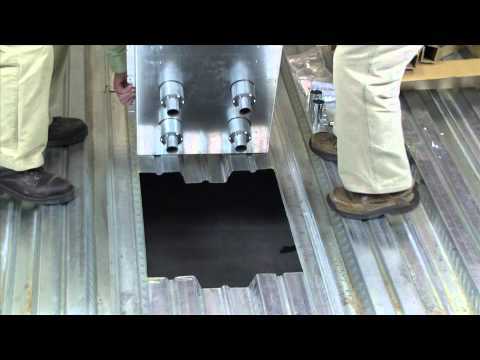 Designed to be installed in above grade concrete floors while maintaining the fire classification of the floor. This box is classified for use in 2-hour fire rated floors. Box comes complete with all components needed for initial installation. Included components are: protective/ disposable cover, tunnel system for connecting the two modules of compartments, fire classified pan, two (2) removable modules, four (4) 1 1/4" trade size intumescent conduit feeds and two (2) cable management guides. Items not included with the box and sold separately are: receptacles, communication jacks, and A/V devices and device plates. NOTE: For use on bare (polished) concrete or terrazzo floors EFB610-CTR must be used. (Sold separately.) Designed for new construction applications. Consult structural engineer before making cuts into decking. Add additional supports as instructed by the structural engineer. Outlet Boxes and Fittings Classified for Fire Resistance Wiremold (R8209) Type EFB6S-FC, EFB8S-FC and EFB10S-FC preset electrical insert for use in 2-hour fire rated D900 Series Floor-Ceiling designs constructed with nominal 2" or 3" deep fluted steel floor units having a nominal 5" wide valley and crests spaced 12" OC, with a minimum 3 1/4" (83mm) thickness of structural concrete topping. The assembly preset electrical insert with floor plate kit and service activations fitting will not reduce the 2-hour fire rating of the floor assembly when installed in accordance with the installation instructions accompanying the preset electrical insert and when the preset electrical insert are spaced 2' (0.61m) OC with not more than one unit per 4 square feet (0.37m2) of floor area in each span.